All would-be subversives take note, regardless of your area or epoch of specialization. This article is about sedimentary context--association--and only nominally about the Middle Palaeolithic. Even if you're not someone who gets a kick out of interpreting site sediments, and prefers to leave that to the 'experts,' you'd be far better off sticking with this post because one day, sure as shootin', you'll need to have these skills under your belt lest you fall for the oldest geomorphological trick in Mother Nature's book. In 2001 Mazza et al. (2004) discovered some very interesting lithic artifacts in a galaxy far, far away the Campitello sand and gravel quarry, near Bucine, in Italy. One was half encased in birch tar, and bore the unmistakable negative impressions of the haft. Cool enough, you might say. Trouble is, the claim is that it's Middle to early-Late Pleistocene in age. More Neanderthal chemical engineering? Wait and see. A tip of the hat to Marco Langbroek for making this image available to us. Thus, the gauntlet is thrown down (a lot like the gloves in a hockey game, in actual fact, which is, as you know, the national sport of my home and native land, but which I never played). This'll be most difficult trial in the short tenure of the Subversive Archaeologist. After sowing the seeds of doubt with respect to claims of Middle- to Late-Pleistocene birch tar from Inden-Altdorf, Germany (Pawlik and Thissen 2011), I should say at the outset that I've no quarrel whatsoever with the chemical characterization of the Campitello Quarry mastic as being that of birch tar. Mostly it's because the same chemist that organized the real chemical characterization of birch tar is a co-author on the Campitello Quarry paper. So, where does that leave the subversive? If ya can't fault the evidence, you might be able ta find fault with the context. I think the Italians were expecting a little flak on the matter of context. In the following quote from their introduction, you'll notice that they are quick to point out their biostratigraphic evidence, which they aver will corroborate the putative age of these objects. Elephant and rodent remains were exposed in November 2001 in a clay pit, Campitello Quarry, in the outskirts of Bucine, a small village in the southern part of the Upper Valdarno basin, on the left hydrographic side of the Arno River. … The bones were entombed in fluvial gravels and sands stratigraphically dated to the Middle Pleistocene. A more clear-cut chronological indication is given by the rodents which prove that the finds date back to a moment of the late Middle Pleistocene [emphasis added]. As I was reading along, as I'm sure you will, too, I noticed that the artifacts and Elephas remains were found in sediments first described as a 'clay pit,' then as 'fluvial gravels and sands,' and finally as the fluviatile, 'massive, grey-green sand' of the latest stratigraphic unit, the Monticello Succession of the Valdarno Basin. 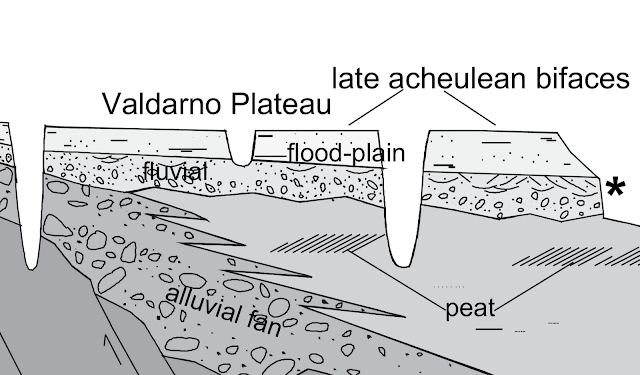 Here's a schematic cross-section of the Arno River Valley from the article. I want to go here. Look at the name of the mountain range in the south! This sedimentary context is one in which chronostratigraphic 'mixing' is not just possible, but likely. 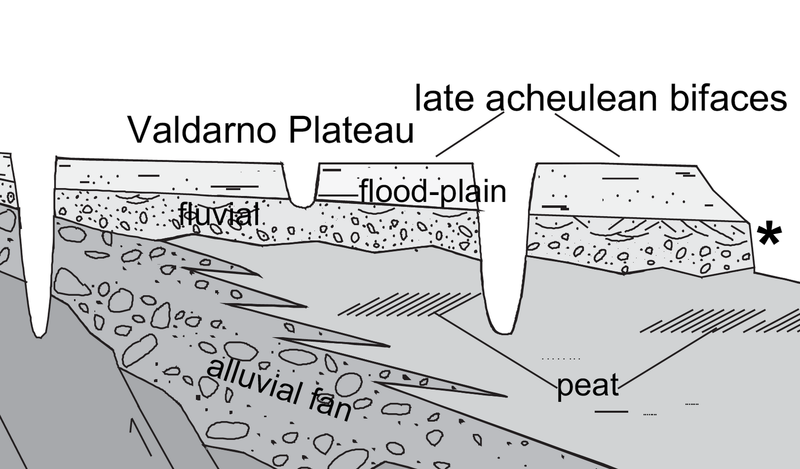 In this case, the most recent sediments are identified as 'flood-plain' and these form a terrace, capping the older sediments in a recently formed, deeply dissected valley system. These recent erosional features are illustrated by the narrow U-shaped voids that have exposed the stratigraphic sequence to varying depths across the Valdarno Basin. Such erosional gulleys and valleys are notorious in archaeological lore because they're places where younger clasts can easily be introduced into older sediments, and be unrecognized as such by the excavators. In this case, the excavators arrived after some of the Elephas bones were discovered (presumably by workers quarrying for sand and gravel--a common enough occurrence in such geological formations), which means that, at least for those objects discovered during quarrying, ALL of the overburden had already been removed. The authors do not say whether or not the portion they actually excavated was taken from beneath 15 or so metres of more recent sediments. But you'd think they might have mentioned it if they did. So, there's at least a possibility that the sand in which they excavated was not the sand that had lain undisturbed for upwards of several hundreds of thousands of years. 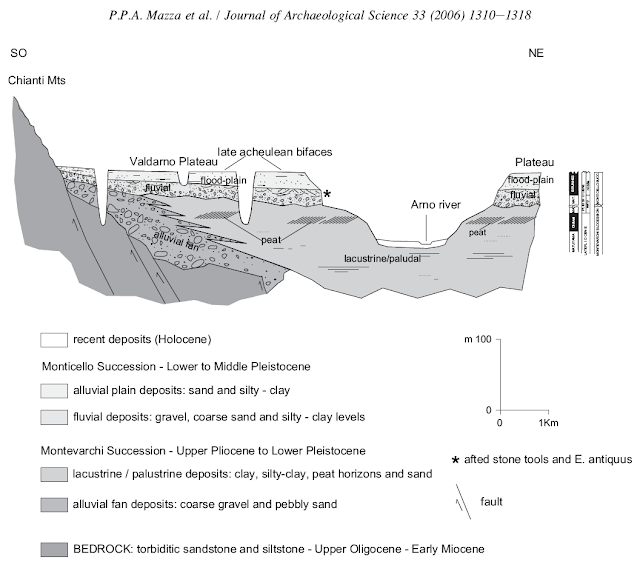 Take a closer look at the Valdarno cross-section, which I've pumped up in the illustration below. Here you can see these U-shaped erosional gulleys, and you don't need much of an imagination to see how it's possible for items of any age to be introduced into what are much older sediments as these features evolve. Couple that possibility with the absence of any real contextual evidence (or published description) for what lay stratigraphically superior to the bone and stone remains, and you have a recipe for, at a minimum, serious questions about their true provenience(s). By the way. The notation with respect to the Acheulean is only meant to convey the presumed age of the oldest artifacts found terrace-top. Everything up to and including yesterday is up there, too. Luckily for us, the Mazza et al. 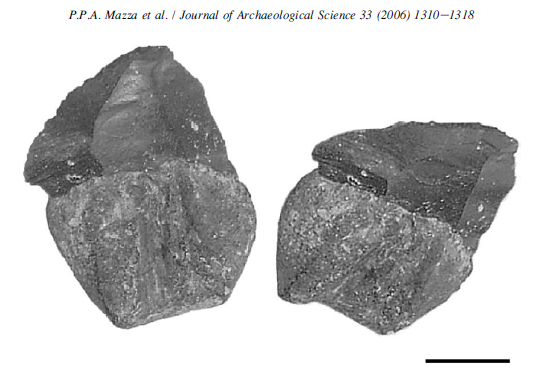 article provides several clues that the bones and lithics were indeed introduced from younger sediments. The first of these is the grain size of the enclosing sediments, which is described as fluviatile sand in a point bar context. Any stream that is depositing nothing but sand at some point in its journey has long since lost the energy to transport larger and heavier clasts, such as Elephas bones and the relatively massive lumps of stone and tar. That said, a river laying down sand at a point bar still has considerable speed and transport capacity, even if it's bedload is well-sorted sand, which leads me to the second observation. The third clue given in Mazza et al. is that the lithic artifacts are patinated. This implies a considerable time spent in the open (ask anyone). Again, this isn't what you'd expect on a point bar. The fourth clue that all is not as it should be is the context of the microtine fauna, described in this way. [the microfauna were found] in a layer of fine sand, silty clay and thin laminae of organic debris, that coated the sand bed which contained the stone implements and the elephant skeleton [emphasis added]. Such sediments could NOT have been deposited in a point bar. Full stop. Unless, that is, the river suddenly turned into a basin in which water stood still long enough for the fines (i.e. clay and silt-sized particles) to settle out. Something just isn't right about the archaeologists' interpretation of the sedimentary context of these objects. There can be no doubt of that. Notwithstanding the fine work done by the faunal specialists in identifying the Mid-Pleistocene microfauna, or the chemical characterization of the birch tar, or the taphonomic study of the Elephas bones, there is nothing coherent about the archaeological context of these finds. Every aspect of the archaeologists' description contributes to the strong suspicion that the substantive finds are not all from the same time. To give you an example of how easy it is to get fooled by the complex depositional processes in geomorphic contexts like the Valdarno Basin, one need only recall the famous 'Old Crow Flats caribou flesher' that caused a big stir amongst Paleo-Indian archaeologists in North America and abroad in the late 1960s and on into the 80s. Discovered in a point bar of the Old Crow River, this caribou bone artifact was found associated with 25,000 year old animal bones. The same type of caribou tibia artifact as that found at Old Crow Flats (Illustration credit). The following is a snippet of a synopsis of North American archaeology that appeared in Archaeology magazine in 1999. In the summer of 1966, a paleontologist collecting fossils from along the Old Crow River in arctic Canada found amidst a jumble of bones from now-extinct Pleistocene animals a caribou tibia, its end carved into a toothed spatula. The mammoth remains found with the flesher appeared to have been flaked and fractured, like artifacts. The specimens were more than 25,000 years old, far older than anything then known from the western hemisphere. ...redated in the 1980s the caribou tibia flesher proved to be only 1,350 years old. from David J. Meltzer, 'North America's Vast Legacy,' Archaeology 52(1), January/February 1999. Those with long enough memories will bear me out on this matter. In closing, I'd like to offer a challenge of my own: that Mazza et al. subject a minute sample of the birch tar for radiometric dating--specifically radiocarbon. I'll bet my well-worn Marshalltown that it doesn't exceed the limit of radiocarbon dating, which, as most of you know, is (at the extreme end of extreme) not above 75,000 years, and is normally cited as give or take 50,000. Definitely not Middle Pleistocene, but could be Late. My guess is that it's no more than terminal Pleistocene or Holocene in age.